The 106th edition of the Lamar Hunt US Open Cup is now officially underway with opening round qualifiers wrapping up this past weekend. Two more games were postponed, but of the 36 games that were completed, there was plenty of drama. GPS Omens (Mass.) took Southie FC to overtime and won with just 10 men while NTX Rayados scored an equalizing goal in stoppage time and prevailed in a dramatic and controversial penalty kick shootout. Some previous champions are still in the hunt as well with the four time champion Ukrainian Nationals and three-time champion New York Pancyprian Freedoms both advanced. Christos FC, who advanced to the Fourth Round of the 2017 US Open Cup, also won their first qualifier. Two matches were postponed due to heavy rain in Texas. 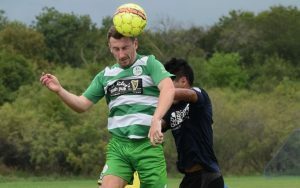 San Antonio Runners and the Celtic Cowboys Premier had their game in Austin rained out, and Leon FC and the Bay Area Oilers FC were washed out in Houston. Make-up dates will be announced soon. This will be the fourth year of the new qualifying format, and as always, TheCup.us is providing the best coverage of the US Open Cup. Check below for a short recap of each match. For the third time, GPS Omens and Southie FC squared off in the US Open Cup qualifying tournament. In 2015, Southie FC knocked off GPS in a “Win & You’re In” match. Last year, the two Bay State Soccer League teams met and GPS got their revenge with a 4-0 win. On Saturday, due to some scheduling challenges, GPS played the entire match with 10 men. Despite playing shorthanded, both teams traded first half goals and they remained deadlocked into the second extra time period. The match seemed to be headed to penalty kicks, but Danny Goldman scored what would prove to be the game-winner. Last year, Safira FC and Mass United FC met in the Second Round of this same US Open Cup qualifying tournament. Mass United won 2-0. This year, things are different. Both teams joined the UPSL and Safira avenged that loss with a 3-1 home win. Pablo Guimaraes scored a goal in each half and Hugo Bomfim added another as Safira moved on to Round 2 for the second year in a row. It was a familiar matchup as Cosmopolitan Soccer League foes Lansdowne Yonkers FC (formerly Lansdowne Bhoys FC) and the New York Pancyprian Freedoms met for a 2019 US Open Cup qualifying matchup. The Pancyprian Freedoms scored one goal in the first half to take a 1-0 lead at the break, then added three in the second half to claim a 4-0 victory for the Freedoms. Adam Himeno was involved in three of the four goals (2 goals, 1 assist) as the three-time US Open Cup champions are attempting to qualify for the tournament for the first time since 2016. A back and forth affair saw Motagua of New Orleans defeat Port City FC 5-2 in extra time. Playing on its home turf, Motagua took the lead in the 10th minute. An own goal put Port City in front 2-1 before halftime but Brandon Chagnard converted a penalty kick in the 78th minute and the match went into extra time. New Orleans took the game over in extra time with Nestor Peralta and Samir Arzu adding goals in the 96th and 118th minutes to claim the three-goal victory. Motagua qualified in 2016 and fell one game short of the tournament in 2017 and 2018. Now they advance to Round 2 for the fourth year in a row. A scrappy and tense match saw the UPSL Florida Conference playoff champions ASC America SC dominate most of the match while Orlando FC Wolves fought every minute to keep it level. Despite maintaining their dominance throughout the match, poor finishing kept America scoreless until the 105th minute. The game’s lone goal came after a series of poor defensive clearances from the fatigued and battered Wolves players. America SC capitalized with an interception and a quick lobbed ball over the left side of defense which left Alexandre Teixeira with ample space in front of him. Going one-on-one with the keeper, he beat him to the near side. The second half of extra time concluded with America holding out defensively and keeping their opponents on edge with several counter-attacks to seal the one goal victory in the club’s Open Cup qualifying debut.. The Florida Soccer Soldiers made the most of their Open Cup qualifying debut with a 2-1 win over Miami Sun FC. The Soccer Soldiers, who won the UPSL Florida Conference regular season championship in their first year with the league, defeated their fellow South Florida UPSL rivals, who are also relatively new to the UPSL (founded in 2016). Earlier this year, NTX Rayados had the breakthrough that they had been seeking in what was their 7th consecutive US Open Cup appearance. They upset their first pro team and won $25,000 in prize money as they advanced to the Fourth Round where they fell to the Houston Dynamo. They accomplished that with a number of dramatic moments. In a game between a pair of qualifying first-timers, California United FC II and CaliGators exchanged goals in the opening 22 minutes. Cal United then rolled off five unanswered goals to end the first half. They never looked back and cruised to a 6-2 victory. Gustavo Villalobos led the way by finishing off a hat trick in just 44 minutes for California United FC II of the UPSL. It took just five minutes for hosts Academica SC to put one past Davis Legacy on Saturday with Adrian Plascencia scoring off a Gera Cazares pass for the only goal of the first half. But the Legacy would fight back, scoring five minutes after the break through Joe Skvarna. In the 64th minute, David Esparza scored the eventual game-winner, before a late brace from Ramiro Ceja sealed the match and allowed Academica to reach the second round of qualifying for the second year in a row. A late goal from PJ Garcia was all that was needed for the Oakland Stompers to get past the Oakland Leopards and move on to the second round of qualifying. Former Sacramento Republic (USL) star Dominik Jakubek recorded the clean sheet and took man-of-the-match honors. The Redwood City-based JASA RWC had no trouble in their Open Cup qualifying debut, dominating the San Ramon Dynamos, 7-0. Alejandro Escobedo earned the clean sheet in goal for JASA and they received goals from Emanuel Vazquez (2), Ugo Uche (2), Ryan Masch, Alexander Herra, and James Huffer. Santa Ana Winds FC put forth a dominant effort against Los Angeles Wolves FC with a 4-0 triumph in a US Open Cup edition of the Sunset Derby. The UPSL side was led on the day by Jordan Gorman, who had a hand in all four goals that were scored. Gorman notched a hat trick and then assisted on a goal by Mark Cruz to lead the Winds to victory. For the Winds, they take one step closer to qualifying for the second year in a row. While the Wolves, who have qualified for the US Open Cup in each of the last three years, will fail to make it four in a row. Cal FC, who recently returned to the UPSL after a two-year hiatus, now move on to the second round of qualifying, taking another step toward qualifying for the tournament that helped them make a name for themselves. In 2012, Cal FC stunned the Portland Timbers to become the first open division local club to oust a Major League Soccer team without penalty kicks. They have not qualified for the tournament since 2015. However, after the match was over, San Nicolas filed a protest, claiming that Cal FC is ineligible because they did not participate in a league last season. Cal FC provided an explanation to TheCup.us and you can read all the details HERE. The USSF eventually denied the protest. A pair of qualifying first-timers from the Orlando area squared off with Sporting Orlando earning a 2-1 win over Deportivo Lake Mary. Luca Lantin opened the scoring in the first half only to see Lake Mary equalize early in the second half. Vinicius Oliveira then played the hero, scoring what would prove to be the game-winner midway through the second half to give Sporting their first-ever qualifying win. The four-time US Open Cup champion Ukrainian Nationals dominated American soccer in the 1960s, but they haven’t attempted to the qualify for the competition since 2015. They haven’t successfully qualified for the Open Cup in a couple of decades. But the Nats took the first step to breaking that streak with a 2-0 win over the United German Hungarians (UGH), another club with a rich history from the Philadelphia area (UGH was founded in 1910 and started playing soccer in 1922). Jordie Griffith scored both goals on what was a wet and rainy afternoon in North Wales, Pa.
Aegean Hawks FC claimed a 2-1 victory over Steel Pulse FC on Sunday afternoon at Troy Park in Elkridge, Maryland – the match was one of two US Open Cup matches happening simultaneously at the park, as Christos FC and Rockville SC also faced off. In the match-up between Aegean Hawks FC and Steel Pulse FC, a 6th minute goal from Austin Stewart gave Aegean Hawks FC an early lead. While this score remained through halftime, Aegean Hawks FC added a second goal in the 66th minute to extend their advantage. Steel Pulse FC quickly responded with a goal through Sam Mensah in the 70th minute, but could not find the equalizer as the Hawks held on for the 2-1 win. The Hawks, who have qualified for the US Open Cup three times (2007, 2009, 2012), are trying to get back to the tournament for the first time since 2012. Christos FC made a name for themselves in 2016 when they won three games in the 2016 US Open Cup and earned a date with D.C. United of Major League Soccer. While they fell to United that day, they represented what makes the US Open Cup special where even an amateur team sponsored by a liquor store from Baltimore can face off with a team from MLS in a meaningful, knockout competition. However, they were unable to rekindle that fire last year when they qualified again, but lost in penalty kicks in the opening round to Reading United AC of the PDL. Christos took the first step toward getting to the tournament for the third year in a row with a 4-1 win over fellow Maryland Major Soccer League side Rockville SC. All four goals were scored by former Maryland-Baltimore County standout Pete Caringi III. Caringi played a major role in the team’s 2016 Cup run where he became just the second Open Division local player to score a hat trick in the Modern Era and was named TheCup.us Player of the Round in a First Round win over Fredericksburg FC (NPSL). Soda City FC dominated from start to finish in its 5-1 win over FC Cardinals on Sunday afternoon. Both teams were making their US Open Cup qualifying debut as the hosts opened the scoring in the 9th minute when Hunter Haynes headed in a long throw-in to give Soda City the early lead. In the 30th minute, Homero Jacobo added a second on a cross from Dean Smith. Just before halftime, Smith added a goal of his own to give Soda City a 3-0 lead. In the second half, Smith tallied his second goal of the match in the 51st minute while substitute Mitchell Roberts netted a fifth for the home side in the 83rd minute. FC Cardinals scored their only goal of the match in the 89th minute to round out the scoring as Soda City FC claimed the 5-1 win. A high-energy first-half saw five goals between Ann Arbor FC and Livonia City FC, with the goals coming in bunches. Livonia City jumped out to a two goal lead with McKenzie Bechard and Billy Werthman scoring in the 20th and 25th minutes, respectively. Ann Arbor FC responded with three straight goals to close the half, the first from Casey Bantle in the 36th minute and a brace from Drew Ducker, who netted goals in the 38th and 41st minutes. In the second half, Livonia City FC brought the game back level with a goal from Pat Smith in the 52nd minute, and the score remained 3-3 until extra time. A second yellow card to an Ann Arbor FC defender saw the side reduced to 10 men in the 105th minute, which Livonia City FC took advantage of in the second extra time period as Craig Beebe found the winner in the 116th minute to see LCFC advance to the next round as the last remaining Michigan club in the tournament. The Colorado Rovers snapped a three-game losing streak in the US Open Cup qualifying tournament with a 1-0 win over fellow Colorado side Club El Azul. The Rovers did this despite receiving two red cards (and another member of the team’s bench was sent off as well). The Rovers’ win was their first since this qualifying tournament format was launched in 2015. The team had previously qualified for the 2013 and the 2014 tournament out of the USSSA’s qualifying tournament. It was a tense and competitive battle between the two Massachusetts-based clubs. By the time halftime hit, both teams had already received a red card and were playing with ten men. Boston City would break through in the 52nd minute when Jhonata Batista scored on an assist from Marcelo Cunha. City was able to hold on to that lead even after Jadson Leite received a red card in the 79th minute. It was Boston’s first-ever Open Cup qualifying win. Buena Park broke the game open in the second half, earning a 4-0 win over Valley United SC. Park captain Nate Da Rosa opened the scoring with a first half penalty kick, and then a second on the other side of halftime. Da Rosa assisted on Eric Young’s goal in the second half and Josh Sonico added another to put the game away. Buena Park is attempting to qualify for the US Open Cup for the first time. Last year, they fell one win short of punching their ticket, losing to the Los Angeles Wolves FC in the final round. DC Cheddar, a name derived from an “inside joke” between the founders of the club and the Super Delegates FC squared off as a meeting of two first-time entries. The Super Delegates from the Maryland Major Soccer League rebounded after giving up what is likely the fastest goal of the round in the 3rd minute. Adrian Johnson would lead the way with a pair of goals, while Cedric Tchoumkeu adding another. Marie Bell dished out assists on two of the three goals for the Delegates. Virginia United pose for a team photo before the club’s 2019 US Open Cup qualifying match vs. Centro America. For the first time in tournament history, teams from the Asociacion Nacional Fútbol en USA entered the competition and, as luck would have it, they would both meet each other in Round 1. Virginia United would earn a victory in the rain by the score of 2-1. Virginia United scored a goal on either side of halftime by Luis Aguilar and Ricky Burke and Centro America would pull to within one on a goal from Mauricio Benavides in the 72nd minute but were unable to find an equalizer in the final 18 minutes of the match. Real Sociedad earned the club’s first regulation win in a qualifying game with a 4-0 win over Quickening on Sunday. The Royals have entered the tournament every year since it launched in 2015, but after a PK win in their debut that year, they have lost three straight games to some significant powers (San Nicolas in 2016, LA Wolves in 2017 and 2018). They snapped that losing streak with goals from Jesse Aguirre, Randy Poggio, Santiago Busatto, and Cesar Arceo. In a rematch of last year’s “Win & You’re In” match that went to extra time, FC Denver won for the second year in a row, eliminating Indios Denver FC, 1-0. The difference was a late goal by Alex Bernhardt Denver won 1-0 in extra time. quest to qualify for the US Open Cup for the fifth time in the last seven years. Unfortunately, a few days after the match, a media report surfaced that claimed FC Kendall is folding. Lionside FC defeated SC Trojans FC, the lone college-based team (USC) in the competition, to earn their first-ever US Open Cup qualifying win. Kevin Geddes scored a goal in each half (37th min., 85th min.) to send the UPSL side into Round 2. In the 37th minute, Matt Dagilis played a ball over the top to Geddes, who volleyed it past the keeper to open the scoring. It remained at 1-0 until the 85th minute when Carlos Valle broke free into the penalty area and had his shot blocked, but the ball fell to Geddes who put the ball into the back of the net to ice the game. LA South Bay Monsters took the lead early on a penalty kick, but a handball in the box would give Outbreak a chance to match them from the spot. Steve Bagheri would score to tie the game in the 33rd minute. Then, about 15 minutes into the second half, a hard-hit cross from Cory Wolfrom found Torey Edwards who scored on a diving header to put Outbreak in front, 2-1. Outbreak were able to survive the pressure from the Monsters the remainder of the second half as they move on to Round 2. Outbreak qualified for the US Open Cup in 2016 and 2017, but fell short in 2018 and are looking to bounce back.